Dear padel lovers, we are lucky because the traditional EuroPadel Mixed trophy in Padel4U2 is here! Reserve the June 17th in your agenda to enjoy padel a gogo. The mixed double competition is limited to 32 teams. The tournament is reserved to 16 teams from EuroPadel, and 16 teams from Padel4U2 members. 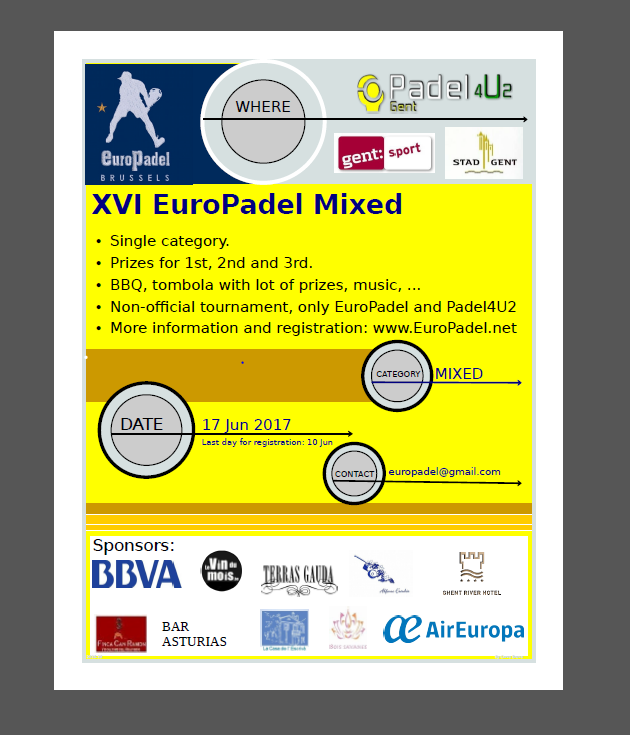 Obviously mixed teams PADEL 4U2/EUROPADEL are welcome as well. Contact europadel@gmail.com if you are looking for a partner to team up with. Each team will play at least three games. This year there will be available a evening BBQ organized by our friends of Padel4U2 and later on we will organize a big FREE raffle during the closing ceremony with great prizes only for the participant players . There will be another challenge match between the two clubs and also Beach Volley competition. Do not loose this occasion to enjoy PADEL in a nice atmosphere. Please indicate as reference “XVI Trophy + your name(s)” in the payment. Then send an e-mail to europadel@gmail.com with the proof of the payment and the players’ name. We will create a WhatsApp group for sharing info/pictures about this event, if you want to be included then please indicate also you phone number in the registration form. Last day for inscription June 10th, so do not wait till the last minute. We will proceed on first-come first-serve basis. Don’t take risks and do it asap !!! No Replies to "XVI EUROPADEL TROPHY IN GENT"